“Get ready for some cheesy chords!” jokes a musician as we open Bogha-Frois (Gaelic for Rainbow), an evening of LGBT+ folk music. 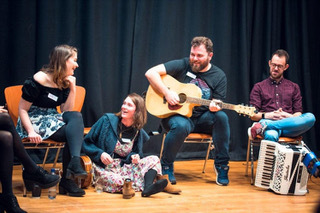 The culmination of an Edinburgh-based workshop, Bogha-Frois showcased LGBT+ folk musicians on the last night of Celtic Connections. Scottish folk music isn’t known for being super inclusive, but this night showed that change is coming, and its going to come from collaboration and support. Although the evening was packed with memorable performances, a highlight was undoubtedly Nic Gareiss, an American step dancer and current artist in residence with the Traditional Dance Forum of Scotland and their partners at the University of Edinburgh. I didn’t know what to expect when Gareiss entered the empty stage with a bag of sand that he poured on the floor, but what transpired was a mesmerising and rhythmic step-dance. His percussive movements of the intimate dance were punctuated with Gareiss calling out his moves, but soon the audience joined in, their whoops and cheers accompanying the soundscape created from his feet. This shifted the isolated, lonely dance to a communal experience between performer and audience. A fitting image for this night of collaboration and community. Other stand out acts included a performance of 17th century folksong ‘Bessy Bell and Mary Gray’, which highlighted the themes of the evening: LGBT+ folk has an existing tradition and has always been a part of Scottish culture. The variety of acts – from cheeky and playful to sombre and heart-breaking – showcased the immeasurable talent and skill from the LGBT+ folk community. As chief organiser Pedro Cameron stated at the end of the evening, there’s not just loads of LGBT+ folk musicians, they are some of the best on the scene. The final two songs offered opportunities for reflection and solidarity, as every performer squeezed on the stage to sing of political battles and looking onwards to freedom. The final song echoed the sentiments of the evening: hope, love, community and a look towards the future. The event was truly something special, and I hope that this points towards a more inclusive and open folk scene in Scotland. The chords may have been cheesy, but the emotion was sincere.